Hilary’s Hemp & Greens Veggie Burger, Sweet Potato topped with tahini sauce and roasted chickpeas, a big bowl of greens and avocado, of course. All the focus is on Thanksgiving but we still need to eat all week leading up to it…. dinner just needs to be super quick, easy and nourishing. That’s why I love Hilary’s Veggie Burgers… all you need to do is heat them up! Certified Gluten-free, Organic, Vegan, made with minimally processed ingredients, free of common allergens, and really yummy! I happen to be a fan of the Hemp & Greens because is made with hemp seeds, lots of greens and lots of herbs like thyme so it has a great herby flavor. Perfect own their own in a salad or with a bun as a classic burger. Post sponsored by Hilary’s but opinions my own. Quick, easy and nourishing! 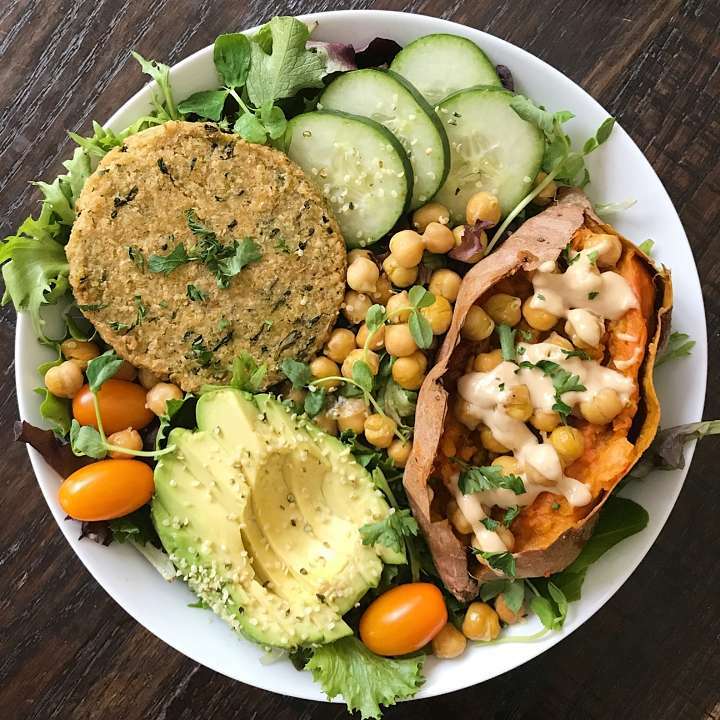 A Hilary's Hemp & Greens Burger, sweet potato with tahini sauce and roasted chickpeas, greens and avocado. Plate created in partnership with Hilary's. Make a slit in the top of each sweet potato. Top with roasted chickpeas and tahini sauce to taste. Place garlic and salt in a food processor and process for 10-15 seconds. Add all remaining ingredients & process until smooth, about 30-60 seconds. You may have to stop and scape down the sides. Taste and adjust as desired. Add more water for a thinner sauce. Toss in avocado oil. Sprinkle with kosher salt. Bake at 400 degrees for 15 minutes.